Jess has turned ten. Ten!! I can't believe just how quickly time has gone. He says that he's "too old for theme parties"! He's "too old for playing with play dough"! He's too big to play with blocks and Tonka trucks. Hmm...to hear him talk, by the time he's 18, he'll be too old to get his own place...we'll just move him into assisted living! Ha! I don't want him to grow up too fast! There is so much yet for him to experience. Of course, at ten, you can't tell him anything. It's all so exciting for me to see him growing up. Anyway, enough or I'll have myself in tears...again! So....I created him a card with a much more 'grown up' feel to it. No kiddy images for him to scoff at! Simple, sweet and to the point! Happy Birthday to you! The sentiment is from Birthday Wish (which will NOT be retiring...only on the dormant list). The cute, I mean, grown up cupcake is found in the Wagon Full of Fun set in the Occasions Mini catty. I love this cupcake! 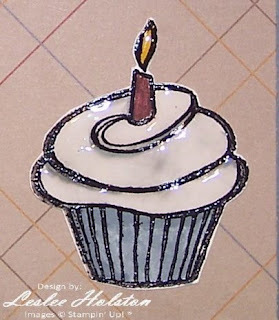 I've embossed it in black, colored it with markers and added Crystal Effects to the frosted top and the candle flame. Very cool! The other cool thing about this card is the fact that I've managed to use up more of the old retired designer series paper that I seem to be collecting over the course of the last 5 or so years. Same can be said for the diamond shape brads that I've been hoarding. The brads mimic the pattern of the paper. The DSP is so old that I've done forgotten the name. I can tell you it is SU! though. 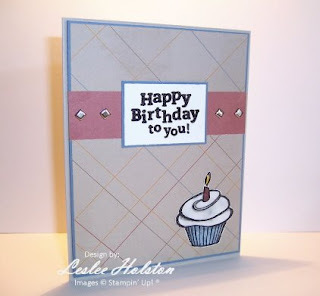 I've also used Sahara Sand and Buckaroo Blue card stock. What do you think? Did I achieve 'grown up'? Comments are always welcome. Thanks for stopping by. I hope you are inspired to stay young!! !